This is a manual puller with three jaws for extraction of most shaft-fitted parts, including bearings, wheels, bushings, gears, and pulleys. Puller have three-jaw construction ensures equal load distribution, secure hold, and concentric pulling action. 10-ton pulling capacity, 6" (152mm) reach and a spread range of 0.5 to 7 inches (13 to 178 mm) for increased pulling leverage! 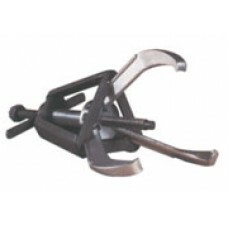 Puller sports tapered jaws for better access in tight spaces.